Mankind has launched its first Android into space. But it isn't so much a human-like automaton as it is a Google Nexus One smartphone. 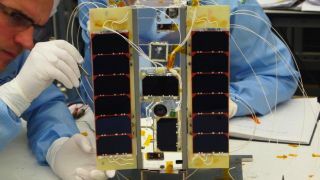 The "phonesat" called STRaND-1 was launched in India yesterday by a team from University of Surrey's Surrey Space Centre (SSC) and small satellite company, Surrey Satellite Technology Limited (SSTL), according to the company's press release. The Nexus One was launched inside a 10cm x 30cm 3U CubeSat, a high-speed Linux-based processor with attitude and orbital controls, along with two novel propulsion systems. SSC launched the nanosatellite mainly as a training and demonstration mission for the CubeSat. It was also designed to test how off-the-shelf technology fares in the alien conditions of space. Though it sounds silly to send a phone into orbit, modern smartphones are more sophisticated than many of the computers we've launched into space. The iPhone 5, some scientists have stated, has more capable computing power than the Mars Curiosity Rover, which is currently trudging around the Red Planet. So, seeing how these devices work in orbit isn't too outlandish. During the first phase of the mission, the new Pulse Plasma Thrusters will be guided by the Linux computer to put the nanosatellite into a 785km Sun-synchronous orbit. It should take about two weeks to test the CubeSat, according to the announcement. Then in phase two, the team will switch over many of the satellite's in-orbit operations over to the Nexus One. If things go smoothly, the smartphone also has a few apps to test in the reaches of space. The app developers were chosen by a Facebook competition held last year. First, iTesa will record the magnitude of the magnetic field around the phone as it's in orbit. The STRAND Data app will also show the satellite's telemetry on the Nexus's display, which will be recorded by another on-board camera. The app will give team members a graphical reference for telemetry to help them identify trends. There's also the 360 app, which will take images using the smartphone's camera to establish STRaND-1's position. The public can also request their own unique images of Earth through the app developer's website. Then there's a fun app to test the old sci-fi motto: In space no one can hear you scream. The Scream in Space app will crank up the phone's speakers and play videos of the "best screams" to see if the device's own microphone will pick it up. After all the fun and experiments are over, the phonesat will take itself out of orbit with a new "WARP DRiVE" propulsion system. But it won't be going the speed of light, as WARP DRiVE stands for Water Alcohol Resistojet Propulsion Deorbit Re-entry Velocity Experiment. Though the project in pretty high in the clouds, there is plenty the public on the ground can do to keep up with this tiny satellite. The Surrey team invited amateur radio operators to track STRaND-1 as it circumnavigates the globe. You can get details of the downlink frequency at www.amsat-uk.org. And if you're still interested but don't want to track the nanosatellite through radio waves, you can always do it socially. STRaND-1 also has a Twitter feed for users to track the mission's progress.